Please don’t scream at your screen (or me) for making you hungry, but I had to share an image of my cheesecake with homemade cherry topping! I’ve made a bunch of cheesecakes from scratch, but this year I decided to try a new recipe, and a new topping! I’ve never made a cherry topping before, but I’m amazed at how easy it was. I hated the idea of using canned cherries. Who thinks that tastes good? So, if you’re out to make this topping, plan on about 7 minutes to wash, de-stem and de-pit your cherries, then about 5 fives to make the sauce on the stove. After that, you need only let it cool down before serving on top of your divine cheesecake. I haven’t tried Smitten Kitchen’s cheesecake recipe. 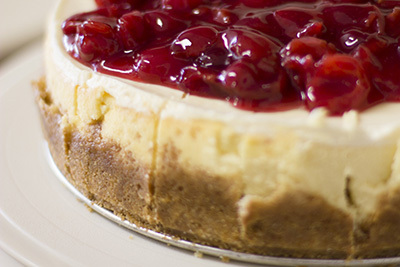 I had already baked my cheesecake using the Joy of Baking New York Style Cheesecake recipe. It was so creamy and wonderful! Ok, now that I’ve got you hungry with all these photos and links, remember to have a wonderful New Year. And if you set goals for yourself (such as making a cherry topping! ), remember to be kind to yourself. PsychCentral has some tips on Setting Nourishing New Year’s Resolutions! Subscribe to this blog for free.